One of the few things I have a terrible time resisting is a new experience, especially when it comes to candy. 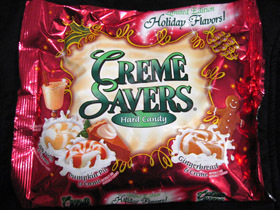 I came across the Holiday Creme Savers at the grocery store this week and saw that “Pumpkin Pie” was listed as a flavor (a vice of mine)! Well before I knew it, the package found its way into my cart. The packaging is very festive and beautiful, it caught my eye right away. A beautiful red shimmery base with green and gold accents. The three holiday flavors are clearly displayed on the front: Gingerbread, Eggnog and Pumpkin Pie. Considering I’m a huge fan of pumpkin flavors and gingerbread (I could give or take Eggnog) I knew I was in for something yummy. Upon opening the package I immediately noticed an uneven ratio of the three flavors. The inside contained roughly 60% gingerbread, 30% eggnog and 10% pumpkin pie. I understand how distribution is never completely even, but I was hoping for more of the pumpkin pie flavor. A shame! Gingerbread: comes in a red wrapper with a gold gingerbread man on it. The candy itself is the standard smooth semi-circle shape, with a creamy white base with brown swirls. It really tastes of a gingerbread cookie! It’s pleasantly sweet without overdoing it. It has a nice slow melt and creamy texture just like all its relatives in the Creme Saver family. I’m now very glad that a majority of the bag is this flavor, yum! Eggnog: Comes in a golden wrapper with red mug design on it. The appeareance is similar to the gingerbread, except the swirls are a nice golden yellow. It’s sweet with a very strong buttery rum flavor. Actually, let me rephrase that, it’s a very strong rum flavor with a sweet, sort of chemical aftertaste. There’s also a hint of nutmeg in the aftertaste as well, but it’s very subtle. You’ll really enjoy this one if you’re an eggnog lover, but I could take it or leave it. Pumpkin Pie: The one I was looking forward to! The wrapper is green with a golden slice of pie on it. 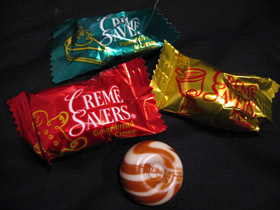 The candy has a beige base with dark orange swirls. The flavor is……strange. It didn’t taste of pumpkin pie at all when I popped it into my mouth, nor by the time I finished it. It tastes sweet, with some odd hint of a floral essence, then finally a peppery/clove/nutmeg aftertaste. I felt like I was sucking on a holiday potpourri. Most disappointing. Overall, I think the Holiday flavors are worth buying. The Gingerbread and Eggnog flavors are pretty tasty, it’s just the pumpkin pie that really lacks. These would look beautiful in the candy bowl at work or a party. Just don’t wonder why only the green ones (yet again, right?) are leftover. You lucked out getting a majority gingerbread ratio! Too bad about the pumpkin pie flavor! I really have to find to try them. They are very intriguing. Hello, I was wondering if you can order the holiday cream savers? My family loved them. But I am not able to find them anymore. Can you please help.